The Oldsmobile 88 gained an all-new look in 1957, one year ahead of corporate siblings from Chevrolet and Pontiac. Rakish, lower rooflines with a larger hood and grille denoted the new bodies, while the famous “Rocket” V-8 was bored and stroked to a significantly larger 371 cid with 277 hp. The highly touted J-2 option, which only added $83 to the price, boosted power output to a remarkable 300 hp. This performance option added triple carburetors (with only the center carburetor working in normal driving) and higher compression, and it bumped the car’s 0-60 time to less than 9 seconds. The Olds 88 was available as either an entry-level “Golden Rocket” or a mid-level “Super Golden Rocket,” with a host of body styles. Two- and four-door Holiday hardtops joined two- and four-door post sedans, a convertible, and a new four-door Fiesta hardtop station wagon. These Fiesta bodies were actually contract built by Mitchell-Bentley’s Ionia Body Company, which was one of the few times that a non-Fisher body was used by GM during this era. 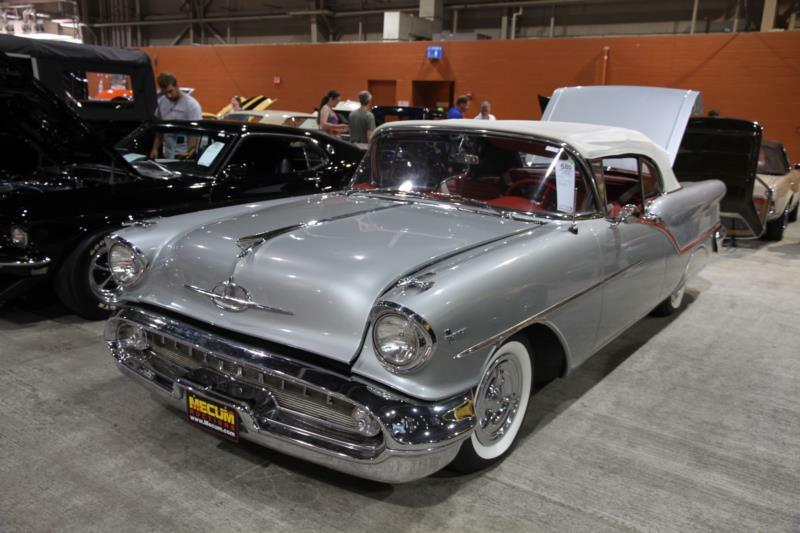 Newly available for 1957 was GM’s built-in air conditioning system, which joined power brakes, power steering, power windows, power seats, and Jetaway dual-coupling Hydramatic automatic transmission on the Oldsmobile option list. For 1958, the big Oldsmobiles became even more massive, with a near complete restyle of the bodywork. Front side covings reached back from four headlamps along the fenders and tapered out on the front doors. Four chrome strakes extended from the mid-rear sides to the huge chrome tail lamp bezels. Under the hood, the Dynamic 88 featured a new two-barrel carburetor that offered a 265-hp rating with 20% better fuel efficiency, while the Super 88 used a four-barrel carburetor good for 305 hp. The J-2 tri-carb setup with 312 hp remained optional on both models. Other new features included a Safety-Vee steering wheel, dual-range power heater, and a removable transistor radio. Perhaps most importantly, Oldsmobile offered New-Matic air ride suspension for all four corners, though reliability issues meant the system was only available through the 1959 model year before it was retired. In 1959, Oldsmobile radically redesigned their lineup to become wider, longer, and lower, but not before half a million of this generation left the line. Today, the 1958 Oldsmobiles stands out as one of the most chrome-clad cars of any era. The cars are also known for their quality of construction, outstanding performance (for a full-size car, at least), and their durability. Conventional wisdom advises to steer clear of any New-Matic systems, especially if you plan on using the car in winter weather, though many such examples have been converted to more common spring setups.